There has been another bombshell Thursday in the ongoing saga of Pennsylvania’s 15th Congressional district. New information obtained by FetchYourNews.com shows an apparent attempt to sway the upcoming GOP Primary to replace the retiring Rep. Charles Dent. 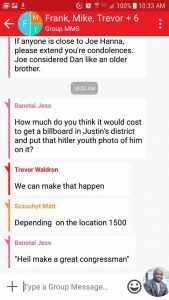 Screenshot text messages show a group conversation between Lehigh County Party Chairwoman Jessica Banotai, Lehigh County GOP Executive Director Trevor Waldron, and others conspiring to smear Conservative candidate Justin Simmons. According to her LinkedIn page, Banotai, 28, is also the Finance Director and successful fundraiser for Charlie Dent for Congress. A separate blog also lists her as having worked with Republican Sen. Pat Toomey. The connection between Dent, Bonotai, Waldron, and others appears to be a smoking gun that proves accusations made earlier in the week. 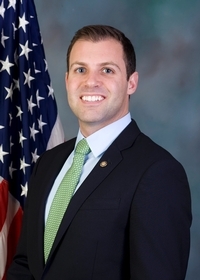 Simmons alleged an attempt by GOP insiders from the 15th District to “stack the deck” in a manner reminiscent of the actions of the Democratic Party against Bernie Sanders in 2016. However, unlike the alleged DNC corruption, the latest revelations in Pennsylvania seem to offer hard evidence in favor of Simmons’ claims. The match up between Mackenzie and Simmons was portrayed by The Morning Call as a “Hatfield’s and McCoy’s race” between what they described as two longtime rivals. 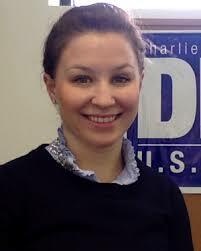 Simmons, 31, has also served in the PA House of Representatives since 2010. 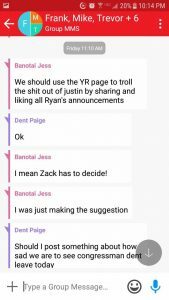 In an exclusive interview with FYNTV on September 11, he alleged a history of campaign rigging within the Pennsylvania establishment regarding Mackenzie. When he first ran for State House in the 134th District… there was a special election and the party hierarchy greased the skids for Ryan, they cleared the field in the special election for him, he hasn’t had an opponent since. This is just the latest in a series of events that have unfolded since the election and inauguration of President Donald Trump. Dent, a seven term Congressman, has been vocal in his opposition to both the candidacy and Presidency of Trump that included several appearances on Liberal mainstream media outlets. This resulted in a Conservative rally against him. Since Simmons initial announcement to run against him, Dent made and abrupt retirement announcement and Mackenzie entered the race the following day. Earlier this week, reports also surfaced that a plan existed within the PA GOP Establishment to have Dent retire before his completed term. This would ensure party insiders the ability to choose the candidate in a Special Election, thus providing Mackenzie with the power of the House Republican campaign machination. Below is a video in which Good Morning from the Office host BKP reached out to Dent via phone call. Dent would neither confirm or deny rumors of retirement prior to the end of his term. Simmons has since called for the resignation of all involved. Stay with FetchYourNews.com as more developments occur.